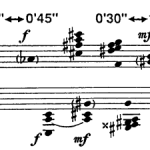 The notation makes it clear that Cage leaves various specific aspects of the continuity of Two up to the performer. What isn’t clear is how, as a performer, one is supposed to make those decisions. I practice just about every day, focusing on one or two pieces that I want to really be able to play, but on Sundays I take time to just play, reading through various things that strike my fancy. 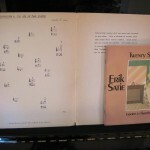 I’m starting to work on learning John Cage’s Two for piano and flute (Frances is playing the flute part on shakuhachi). I thought I’d take a few posts to describe the process of learning the piano part.